Cotswolds Travel and Tourist Information Centre for travelling to and around the Cotswolds region by air, sea, rail, car, and gives highly useful contact information and local markets together with a list of visitor and tourist information centres. From here you can contact the Royal Shakespeare Theatre, motoring organisations, and official bodies to give you details of other areas of the United Kingdom and Britain. You can also find out about famous people that lived in and around or associated with the Cotswolds including William Shakespeare, Sir Edward Elgar, Sir Winston Churchill, John Singer Sargent and Holst. Birmingham International Airport has regular flights throughout Europe, North America, the Middle East and the Indian Subcontinent. Birmingham Airport is only 50 minutes away by car to the beautiful village of Broadway (northern gateway to the Cotswolds). Alternatively, fly into London Heathrow or Gatwick where you are two hours away by car. From Heathrow there is the Heathrow Express train running every 20 minutes to Paddington Station from which ready connections to Moreton-in-Marsh ( 1hr 40mins), Evesham, Worcester, Stratford-upon-Avon. From London Gatwick Airport you can get train to Reading station and from there a mainline connection to Moreton-in-Marsh in the Cotswolds. Alternatively from Gatwick you can get train to London Victoria Station and then by tube to London Paddington and from here to Moreton-in-Marsh. Birmingham International Airport (BHX), is a much smaller, less busy airport than London Heathrow or London Gatwick. BHX, is endearingly referred to as the “Gateway to the Cotswolds,” has direct flights from the New York region on both American and United Airlines, as well on Icelandair via Reykjavik as a stopover. It is easier to retrieve your luggage at BHX and maneuver through customs in just a half hour. To top it off, the drive from the airport to the Cotswolds takes a mere 50 minutes through the English countryside, without the congestion and noise pollution of London. For National Express Coach from London to Cotswold locations Gloucester, Cheltenham, Cirencester, Stroud and Tewkesbury see - National Express Coaches from London. Witney Shuttle Bus to and from Heathrow Airport - stopping at Witney, The Rissingtons, Bourton-on-the-Water and Stow-on-the-Wold. The Cotswolds are easy to reach from Europe with ferry services via Hull, Felixstowe, Harwich, Holyhead and Pembroke. The Eurostar train from Amsterdam, Brussels or Paris links London's St Pancras International Station in just over 3 hours. Le Shuttle, vehicle carrying trains operate between Calais and Folkestone, a journey of about 35 minutes. Stroud - 1st and 3rd Saturday in month, Tetbury - Last Friday in month. Berkeley - 3rd Saturday in month, Wotton-under-Edge - 1st Saturday in month. For further information about Farmers Markets in the Stroud area. Cirencester - Mondays and Fridays, Burford - Fridays, Faiford - Wednesdays, Moreton-in-Marsh - Tuesdays, Tetbury - Wednesdays. These were started in 1919 to provide a place where surplus homemade and home grown produce could be sold to the public. Tewkesbury - Friday, Stroud - Friday. 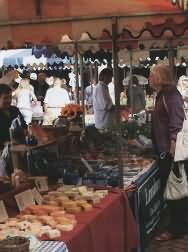 If you would like to know further about the WI markets visit their website at www.wimarkets.co.uk. Aztec West, Almondsbury, Bristol, BS32 4TS. Tel 0333 3210101. Worcestershire WR12 7AP, Tel: +44 (0)1386 852 937, Email: info@beautifulbroadway.com. Clarence Street, Cheltenham, GL50 3JT. Tel: 01242 237431, E: info@cheltenham.gov.uk. The Old Police Station, High Street, Chipping Campden, Gloucestershire, GL55 6HB. Tel 01386 841206 Fax 01386 841681 Email: info@campdenonline.org. Weds - Shuts 12:30 - 13:30 Closed Bank Holidays. The Pump House, 5 Market Place, Faringdon, Oxfordshire, SN7 7HL. 7 Church Street. Tel 01531 822468. 62 Henley Street, Stratford upon Avon, CV37 6QW. Limited service available 5-7pm weekdays and 11-3pm on a Sunday. Closed Bank Holidays. 33, Church Street, Tetbury, Gloucestershire, GL8 8JG. The Heritage Centre, The Chipping. Tel 01453 521541.